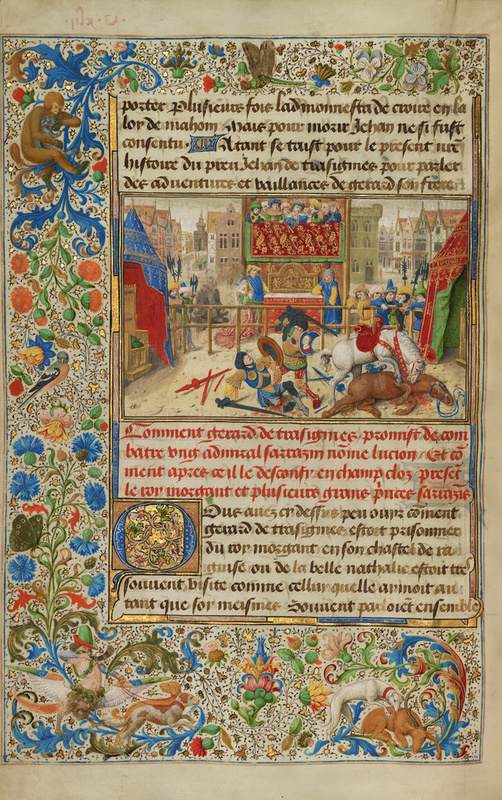 This miniature depicts one of the twin sons of the knight Gillion battling a Saracen admiral for the hand of a beautiful maiden. A look of agony is evident on the face of the defeated as he realizes that he has been vanquished by Gerard, who is about to deliver the death blow. Gerard, meanwhile, locks eyes with his beloved who is depicted on his shield. To the right, the two knights' horses engage in a battle of their own that echoes that of their masters. As a symbol of its master's righteousness, Gerard's horse is pure white, and it, too, is shown as superior to the opponent's horse.